The BMW N54 is a turbocharged straight-six petrol engine that was produced from 2006 to 2016. It is BMW's first mass-produced turbocharged petrol engine and BMW's first turbocharged petrol engine since the limited-production BMW M106 was discontinued in 1986. The N54 debuted at the 2006 Geneva Motor Show and was launched in the 335i model of the E90/E91/E92/E93 3 Series range. Following the introduction of its BMW N55 successor in 2009, the N54 began to be phased out. The final model powered by the N54 is the E89 Z4 roadster, which was produced until 2016. The N54 has won five straight International Engine of the Year awards and three straight Ward's 10 Best Engines awards. There is no BMW M version of the N54, however a high-output version of the N54 is used in the 1 Series M Coupe. The N54 was produced alongside the naturally aspirated BMW N53 engine; both engines have direct injection, double-VANOS (variable valve timing), an open-deck engine block and an electric water pump. Since the N54 is based on the older BMW M54 engine, it has an aluminium engine block (instead of the magnesium alloy used by the N53), a displacement of 2,979 cc (181.8 cu in) and does not have valvetronic (variable valve lift). Turbocharging is a key difference between the N54 and BMW's previous straight-six engines. The N54 has two small low-pressure turbochargers to minimise turbo lag. BMW's marketed the twin-turbo as "TwinPower Turbo", although the term has since been used for engines which have a single twin-scroll turbocharger. The boost pressure is 8.8 psi (0.61 bar) and an air-to-air intercooler is used. Compared with the naturally aspirated BMW N52 that it replaced as BMW's highest performance six-cylinder engine, the N54 produces an additional 34 kW (45 bhp) and 108 N⋅m (80 lb⋅ft). The N54's direct injection system (called "High Precision Injection" by BMW) uses piezo injectors. Its N55 successor uses solenoid-type injectors, because the piezo injectors are more expensive and not reaching their full potential to obtain the "lean burn" benefit. All versions have a bore of 84.0 mm (3.31 in), a stroke of 89.6 mm (3.53 in), a compression ratio of 10.2:1 and a redline is 7000 rpm. The initial version of the N54 is officially rated at 225 kW (302 bhp) and 400 N·m. However, these figures are considered to be under-rated, and independent testing has resulted in estimates of 232 kW (311 bhp) and 422 N⋅m (311 lb⋅ft). 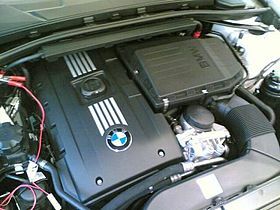 A variant of the N54B30 with higher peak power and torque is used in the 2008-2012 740i and E92 335is. The most powerful version of the N54 is found in the E82 1 Series M Coupe and the E89 Z4 sDrive 35is. Biturbo engine by Alpina based on the N54B30, with upgrades including the engine control unit, oil cooler and pistons. This is Alpina's initial version of the N54, producing 265 kW (355 bhp). Car & Driver noted the N54 had minimal turbo lag and "in feel and sound the twin-turbo could pass for naturally aspirated". The N54-engined F01 740i was also praised for its linear power delivery. Comparing the N54-engined E60 535i with the 550i (using a 4.8–litre naturally aspirated V8), one reviewer noted that the V8 model had more torque but was "only marginally quicker than the 535i" and that the additional weight of the V8 engine was noticeable on twisty mountain roads. In the United States, some N54 engines experienced failures of the High Pressure Fuel Pump (HPFP), resulting a class action lawsuit, a voluntary recall and an extended warranty for the HPFP. Failure of the HPFP can cause the engine to suddenly stop functioning, which has caused several near-misses on highways. BMW was aware of HPFP problems, describing them in internal Technical Service Bulletins as "driveability problems". In April 2009, a class action suit was filed against BMW in connection with HPFP failures. BMW settled the suit in June 2010. On 26 October 2010, following an ABC News story about HPFP failures, BMW announced a recall of vehicles with the pump in question from manufacturing years 2007-2010. The recall was applied to 130,000 cars, resulting in the replacement of the HPFP in approximately 40,000 of these cars. In the United States, the warranty period for the HPFP was increased to 10 years and 120,000 mi (190,000 km). On some cars, the HPFP was replaced multiple times without resolving the issue, potentially leading to the car being refunded under the Lemon Laws in some states. The High Pressure Fuel Pump issue caused BMW North America to extend the warranty for this pump to 10 years or 120,000 mi (190,000 km). The warranty period for the fuel injectors was also increased, to 10 years or 120,000 mi (190,000 km). An updated design for the fuel injectors was also introduced. Due to problems with rattling wastegates caused by premature bushing wear, BMW extended the warranty period for wastegate-related issues to 8 years or 82,000 mi (132,000 km). These warranty extensions only apply to the United States. ^ "Direct Injection, Turbo Pay Off For BMW". www.wardsautoworld.com. ^ "BMW takes home 4 awards from International Engine of the Year competition - N54 and S65 continue dominance". bimmerboost.com. ^ "BMW's Newest I-6 Better, Not Bigge". wardsauto.com. ^ "BMW N54 engine". www.australiancar.reviews. Retrieved 8 December 2017. ^ "Motor Engine: BMW N54 inline 6 twin turbo". motorengine.blogspot.com.au. ^ "Engine Guide BMW N54/N55". drive.com. ^ "5' F10 530i Waterpump - Thermostat". www.realoem.com. Retrieved 8 December 2017. ^ "BMW N54 and N55 Six Cylinder Turbocharged Engines". www.unixnerd.demon.co.uk. ^ "BMW EfficientDynamics: Petrol engines with BMW TwinPower Turbo Technology". www.bmw.com. ^ "2017 BMW X4 M40i Instrumented Test". www.caranddriver.com. Retrieved 10 December 2017. ^ "2011 BMW 335i Sedan". www.caranddriver.com. Archived from the original on 10 March 2016. ^ "2008 BMW 5-series - First Drive Review". Retrieved 5 January 2017. ^ "BMW Technology Guide: High Precision Injection". www.bmw.com. ^ "BMW's Newest I-6 Better, Not Bigger". wardsauto.com. ^ "The latest BMW engine: N55 - found in the BMW 5 Series GT". www.bmwblog.com. ^ "First Drive Review - 2011 BMW 335i Sedan". www.caranddriver.com. Retrieved 16 December 2017. ^ "Press release- Performance Engine Software for BMW 335 Models" (PDF). dinancars.com. Archived from the original (PDF) on 20 September 2010. ^ "BMW 335i Coupe (2006) review". www.carmagazine.co.uk. Retrieved 16 December 2017. ^ "2009 BMW 5-series E61 phase-II (Touring) Wagon X (4WD) full range specs". www.automobile-catalog.com. Retrieved 16 December 2017. ^ "2011 BMW 740i / 740Li - First Drive Review". www.caranddriver.com. Archived from the original on 16 September 2010. ^ "2011 BMW 335is First Drive". Insideline.com. Archived from the original on 21 September 2010. ^ "2010 BMW 335is Coupé". carfolio.com. ^ "New BMW 7-Series F01 Specifications and Photos". www.paultan.org. ^ "BMW 1-Series M Coupe Review". www.caradvice.com.au. ^ "Dyno-Tested: 2011 BMW 1 Series M Coupe". www.insideline.com. ^ "BMW 3 Series E90/91/92/93: ALPINA Automobiles". www.alpina-automobiles.com. Retrieved 18 November 2018. ^ "2007 BMW 335i Coupe - Road Test". www.caranddriver.com. ^ "2012 BMW 740i Sedan - Editors' Notebook". www.automobilemag.com. Retrieved 5 January 2017. ^ "V-8 with Extra Weight- 2008 BMW 5-series". www.caranddriver.com. Archived from the original on 14 January 2016. ^ a b Cohan, Peter. "BMW's Engine Problems: A Safety Risk to Drivers – and the Company?". www.aol.com. Retrieved 16 December 2017. ^ "Kershaw, Cutter & Ratinoff takes on BMW in class action suit regarding defective HPFP". www.bimmerfest.com. Retrieved 16 December 2017. ^ "Jay Alan Morane vs BMW North America- April 10 2009". www.scribd.com. ^ "ABC News airs big expose on BMW N54 engine problems, lawsuits". www.autoblog.com. ^ Morran, Chris (2010-10-26). "BMW Recalls 150,000 Cars Over Fuel Pump Failures". Consumerist. Retrieved 2011-06-22. ^ "BMW Recalls Some Turbo-Charged Cars Following ABC News Investigation". www.abcnews.go.com. Retrieved 16 December 2017. ^ "High Pressure Fuel Pump for Turbo vehicles - BMW 335i, 335xi". www.bentleypublishers.com. Retrieved 16 December 2017. ^ "What's the deal with all these Lemon/Buyback 335i's?". www.bimmerfest.com. Retrieved 16 December 2017. ^ "N54: The best Plugs, Injectors and Coils Thread". www.spoolstreet.com. Retrieved 16 December 2017. ^ "BMW Fuel Injector – Ext'd Warranty, Reimbursement". www.brrperformance.com. Retrieved 16 December 2017. ^ "N63, N74, N54 Injector Update". www.ultimatebimmerservice.com. Retrieved 16 December 2017. ^ "N53 330i Powweerrr loss". www.e90post.com. Retrieved 16 December 2017. ^ "BMW Turbo Upgrades For The Infamous N54". www.foreignaffairsmotorsports.com. Retrieved 16 December 2017. ^ "BMW 135i 335i 535i N54 Wastegate Rattle Fix". www.turbolabofamerica.com. Retrieved 16 December 2017. ^ "N54 Engine warranty extended to 8 Years/82,000 Miles (Wastegates Only)". www.bmwblog.com. 2012-08-16. Retrieved 4 October 2016. This page was last edited on 17 February 2019, at 16:01 (UTC).